After upgrading to Windows 10 Mobile, I cannot find one of my favourite Windows Phone feature: The Project My Screen Functionality. I have tried searching through my settings, but I cannot seem to find the feature anywhere. I have the project my screen app installed, and it functions well. I was using it with this very same phone when it was running Windows Phone 8.1 Update. Is it still available in Windows 10 Mobile, or it was dumped. If it is there, please tell me how i can access it again. It is still available in Windows 10 mobile. But you need to connect your phone to a USB 2.0 port on your computer and don't use a USB 3.0 port. For further reference see this thread from Microsoft community. In response to comments: Now a days, most of the computers and have laptops have USB 3.0 ports as well as USB 2.0 ports. Your phone screen will not project if you are connecting your phone on a USB 3.0 port. Normally in Laptops you will have USB 2.0 ports on one side and 3.0 on the other. If you are unsure which is the USB 2.0 port try all the USB pors. If your computer has only 3.0 ports then currently you cannot use this app. You can also find the USB ports in the device manager. Particulary a USB 3.0 port will have its version mentioned. 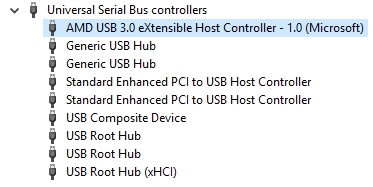 See the screenshot below out of all my USB ports the only one USB 3.0 port has it's has it's version number mentioned on the device manager. Not the answer you're looking for? Browse other questions tagged windows-10-mobile lumia-640-xl project-my-screen or ask your own question. Windows 10 Mobile Continuum support?